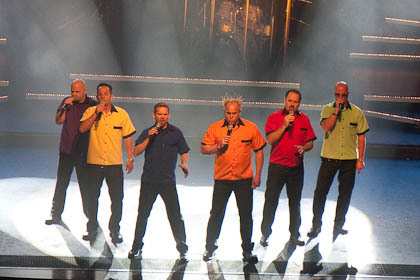 SIX is a vocal group made up of six brothers, Barry, Kevin, Lynn, Jak, Owen and Curtis Knudsen. The group performs in Branson, Missouri. There are ten brothers in the family (no girls), and the other four work behind the scenes. The brothers began singing early on, but really launched professionally together after all six had served as missionaries for The Church of Jesus Christ of Latter-day Saints. After serving missions, the Knudsen brothers spent some time in Los Angeles and Las Vegas performing. In those locations, they went from being totally unknown to performing for some famous people, such as Arnold Schwarzenneger and Clint Eastwood, at A-list Hollywood parties. The six brothers are the oldest of the ten boys in the family, and they began singing together as children, first in church, and then for community events. They premiered professionally on the Donny and Marie Show in 1978. Finally, they began to get regular gigs at the local clubs in Southern California and in 1988 began to perform at Disneyland’s “Blast to the Past“. It was during their stint at Disneyland that they developed enough material to begin getting even better paying engagements. By 1995 they were all able to support themselves fully with their professional singing. They have performed with with Trisha Yearwood, Diana Ross, the Beach Boys, Olivia Newton John, Rod Stewart, the Doobie Brothers and many others. They have also been performing for Royal Caribbean Cruise Lines since 1998. They have now performed all over the world to countless fans. The group has seen great success in Branson, where all entertainment is clean and family-oriented. SIX was awarded Branson’s Best New Show in 2007 and Best Show of both 2008 and 2009. SIX performs the songs of popular artists and then ends on a spiritual note. This page was last edited on 19 January 2011, at 12:11.